1. North Korea: Global stock markets are firmly in the red after another escalation of tensions between North Korea and the United States. Germany's DAX dropped 1% in early trading, while London's FTSE 100 shed 0.6%. In Asia, South Korea's benchmark Kospi index fell 1.1%, and the Nikkei in Tokyo sank 1.3%. Australia bucked the trend with a 0.4% gain. 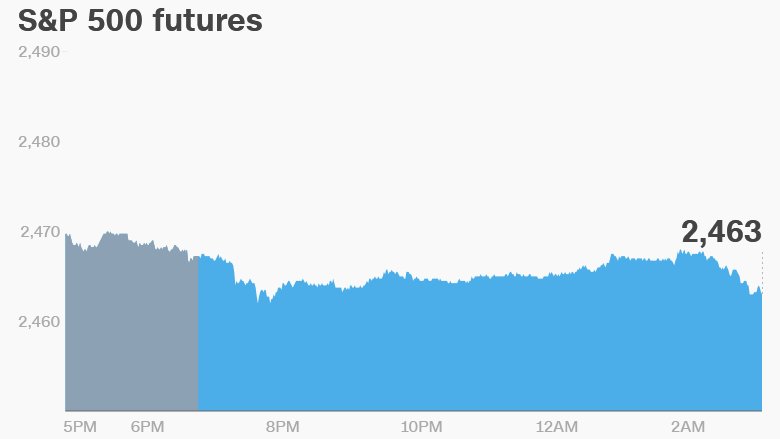 U.S. stock futures were pointing to a weaker open on Wednesday. Meanwhile, investors moved money into assets seen as safe havens. Gold prices increased 1% and the Swiss franc gained against all major currencies. The moves come after President Trump ratcheted up the war of words with Kim Jong Un's regime, saying it will "face fire and fury like the world has never seen" if it keeps threatening the United States. Pyongyang responded with threats to launch preemptive military strikes against the U.S., including targeting the Pacific island territory of Guam. 2. China aluminum duty: The Trump administration has taken the first steps to hit China with a duty on its aluminum foil exports. The U.S. Commerce Department announced a preliminary decision Tuesday evening to tax aluminum foil from China at a rate of between 16.5% and 81%, based on the subsidies it says it receives from the Chinese government. 3. Payments takeover deal: British payment processing firm Worldpay (WPYGY) has agreed a £8 billion ($10.4 billion) takeover by the U.S. cards provider Vantiv (VNTV). The two companies were negotiating for weeks and a deadline to reach the deal had to be extended twice. The combined company, worth £22.2 billion ($28.8 billion), will be called Worldpay. Shares in Worldpay gained 1% in London trading. 4. Murdoch's dream deal: A planned $15 billion takeover of British pay-TV provider Sky (SKYAY) by Rupert Murdoch's 21st Century Fox (FOX) could be delayed further. The U.K. government has asked the country's media regulator to take another look at the implications of the deal. 21st Century Fox will report earnings after the market close in the U.S.
5. Disney breaks up with Netflix: Disney (DIS) said Tuesday that it will end its partnership with Netflix in 2019. Disney also announced it will launch its own streaming services, and plans to acquire a majority stake in BAMTech, a major streaming and marketing service. Shares in Netflix (NFLX) were down 4% in premarket trading. 6. Stock market movers -- TripAdvisor; Priceline; Michael Kors: TripAdvisor (TRIP) dropped 8% in extended trading after earnings missed analyst expectations. Priceline (PCLN) shed 7% premarket after issuing disappointing guidance for the current quarter. Shares in fashion retailer Michael Kors (KORS) were poised to gain after it reported better than expected sales. 7. Earnings and economics: Crocs (CROX), Mylan N.V. (MYL), Office Depot (ODP), Tribune Media (TRCO) and Wendy's (WEN) will release earnings before the open Wednesday, while Jack In The Box (JACK) and Live Nation (LYV) will follow after the close. The U.S. weekly crude inventories report is set to be released at 10:30 a.m. ET.